We’ve reported on several robot hands that enhance the human hand and give it extra strength and endurance. Now Sandia National Laboratories has created a low-cost robotic hand that can help soldiers in disarming improvised explosive devices (IEDs). The Sandia Hand mimics human fine motor movements. If a finger pops off, the hand can use its remaining fingers to pick it up and resocket it. The fingers (attached to the hand with magnets) fall off easily because they’re designed to do so, in case the operator smashes the hand against another object. This prevents the hand from breaking. The fingers’ modular design also means operators can mix and match fingers with different shapes and functions or attach other tools, such as flashlights, screwdrivers, or cameras. Operators control the hand with a glove. to aid soldiers in disarming improvised explosive devices. Developed by a team led by principal investigator Curt Salisbury, the Sandia Hand has a tough outer skin covering a gel-like layer that mimics human flesh. This helps the hand grab and manipulate objects the way a human hand would. Hands are the most difficult part of a robotic system to construct, because of the need to design high dexterity while keeping costs down, Salisbury said in a press release. Sandia puts the cost of most robotic hands at about $10,000 for “each independently actuated degree of freedom” — much too high for distributing to troops. The Sandia Hand, which has 12 degrees of freedom, costs about $800 per degree in low production volumes, Salisbury said. To drive costs down that far, Sandia developed the hardware in partnership with researchers at Stanford University. It also worked with the consulting firm LUNAR to select motors, research skin-simulating materials, perform cost-of-goods and cost reduction analyses, and research design-for-manufacturing considerations. 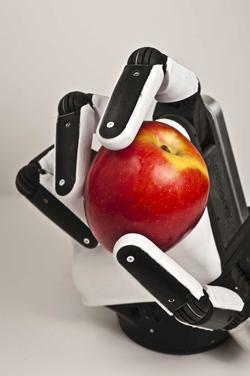 The Sandia Hand was funded by DARPA’s Autonomous Robot Manipulation Program. The hand’s dexterity may also help investigators track an IED’s makers after the hand has disarmed it. Instead of simply blowing up the device, the hand could perform delicate disarming operations that preserve evidence. Researchers did not say what kind of evidence could be used to detect IED makers, but chemical evidence is at least one kind that comes to mind.